Other than full scale Interior Design services, sometimes clients want customized services based on their budget or time restraints. After meeting at a client’s home for a design consultation, my client wanted me to create a custom design board and floor plan for her living and dining spaces She wanted a look that was simple, yet added much needed color and organization. She wasn’t ready to hire a Designer full-time, wasn’t in a rush, and would rather implement the design herself. 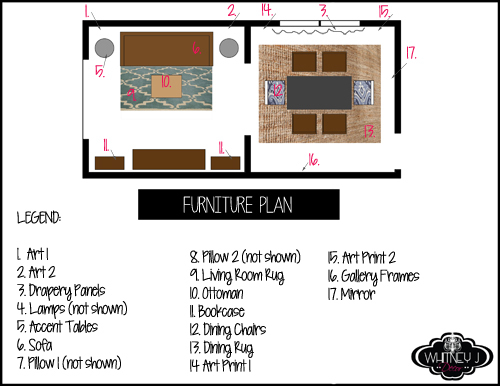 She just needed someone to design the perfect plan for her mostly unfurnished (besides a sofa, media stand, and dining room table) living and dining rooms. For privacy reasons, I can’t show the before pictures, so you’ll just get to see the boards and floor plan. 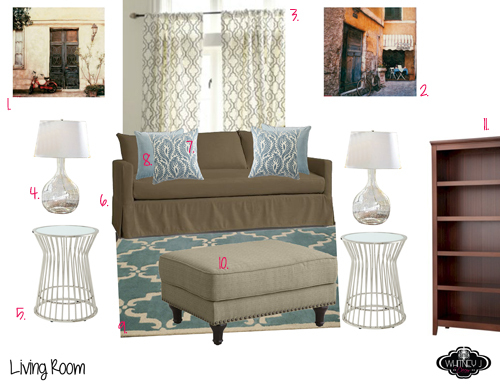 My client loves the new furnishings chosen for the spaces and will implement the plan as her budget and time allows. She describes herself as a very simple person, so she wanted to keep the colors of the spaces simple, too. Since the few pieces of furniture that she has are dark brown and the wall color is a light brown color, I chose to complement it with blue. I decided to present items that were a bit out of her comfort zone for maximum impact in the space. These accent tables are my favorite part of the design, since they are definitely impactful and unique. She loved them! Since I love mixing patterns, I matched the beautiful drapery panels to the new rug I chose, but brought in a different, floral pattern for the pillows. These art canvases match an art print in her kitchen that she loves and is a great way to bring in additional color. Later on she can add in more color without the fear that it won’t match what’s already going on in the space. Red, or even orange, would be a great pop of color in the space if she finds a pillow or other accessory that she loves. My client loved this chair from Pier1 and really wanted to implement different shades of blue with the brown wood furniture that she currently has. These drapery panels are the same as those in the living room design board and I gave her three options (#’s 20-22) to place on her current dark brown dining room table. Options 14 and 15 are photography prints of French doors found on Etsy. The jute rug was the perfect complement to the blues in the other furnishings and has the same shade of the current brown paint on the walls. Above is the furniture plan that shows where each item should generally go in the space. It does dual function as a legend for the living and dining design boards, and I even pointed out where the items chosen for the walls should go. As you can see in the furniture plan, the spaces aren’t very big, which is why there’s no living room chairs. The new dining room chairs in the plan can be easily moved into the living room, if needed. Not shown in this post is the shopping list that shows my client where she can purchase each and every item that I suggested. I emailed them all to her as a PDF file, so she can save or print them out and refer to as needed. The design boards, furniture plan, and shopping list are all offered as part of my E-Decor services for both local clients and those near or far away from the New Orleans area. If you’re interested in E-Decor services, check out my services page or shoot me an email for more information. So, what do you think of the design boards above? 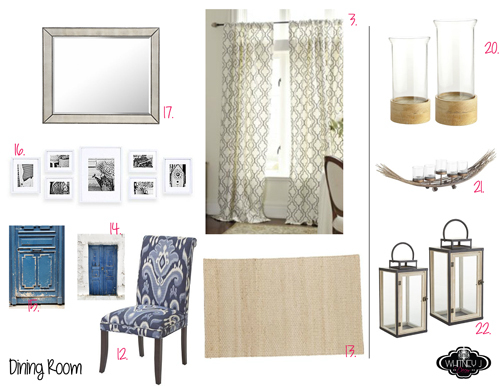 Have you ever done a design board for your own home? Be sure to leave a comment. However I fall in love with living room I thought everything so beautiful. This made me inspired to try new projects, Great article ! !